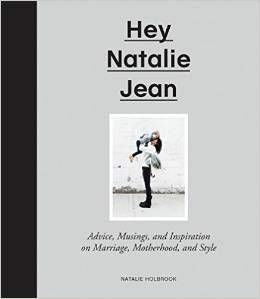 HEY NATALIE JEAN: magical moments and some exclamation marks !! ! !! magical moments and some exclamation marks !! ! !! look, not to be cheesy or anything, but today was pretty fantastic. 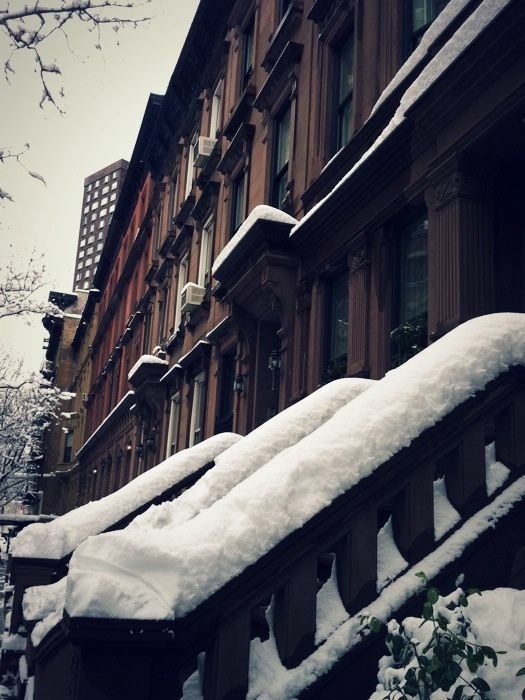 look at that brownstone! you better believe i am going to write all about it, in excruciating detail. i scored some insane moccasins today for so stupidly cheap that i still can't believe it. i want to pet them lovingly and sleep with them under my pillow for the rest of my life. i went out for the afternoon with the huckadoodle to visit a friend. while we were out we discovered that yesterday's piles of snow had multiplied, and that it was now necessary for me to lift the entire being of the stroller using just my spaghetti noodle arms to clear past the snowdrifts blocking the intersections. there was so much snow and sludge and muck in the streets that at one point we got hopelessly stuck. out of nowhere a man and a woman appeared on either side of huck's stroller. they gently lifted him up and over those mountains of snow, and as he soared through the air a goofy smile broke across his sweet chubby face. when we were safely across the street and back on firm ground i thanked them profusely, only to discover that they were italian! the laundry mountain in the southeast corner of our bedroom has grown to such monstrous proportions that i think i could climb it and yodel from the top! how fun would it be to learn to yodel? while he was wowing job people over the phone with his sultry job interviewing voice and huck was napping off a particularly bad mood, i was sent off to procure dinner. "anything you want! and take your time!" my holbsy said as i piled on my winter gear. so of course i went to shake shack because i am programmed brainwashed uhhhh . . .
on the way there i stopped in a store i've always wanted to stop in. strangely i was the only person in there aside from at least million employees, who were all there to set up "the february line." i was asked how i was doing no less than thirty times. it gave the entire operation quite a mystical feel, like possibly i had opened those doors and waltzed into some magical bizarro world where everything existed just for me. the j.m. horton ice cream company? i found out today that david hasselhoff follows me on twitter. david hasselhoff. whaaaat. the pajamas i bought for huck in soho five years ago finally fit him. this is my very favorite. seeing your dream baby in a pair of pajamas you bought for him when you were so young and hopeful is such a very wonderfully trippy feeling. and then a reader emailed me this. i don't know, but i think this is just about it for me. best day ever. Oh gosh, I love it. I could totally tell you were having the best day ever while I was reading! huck's pj's are adorable (as is the huckSTAR(cuz i typed huckster, but then thought "he's a star!" and there you have it)). the artwork is awesome. and also hooray for helpful italian stranger-angels! happy friday, natalie, tho how it can compare to thursday, i do not know! Made me happy just reading your post! 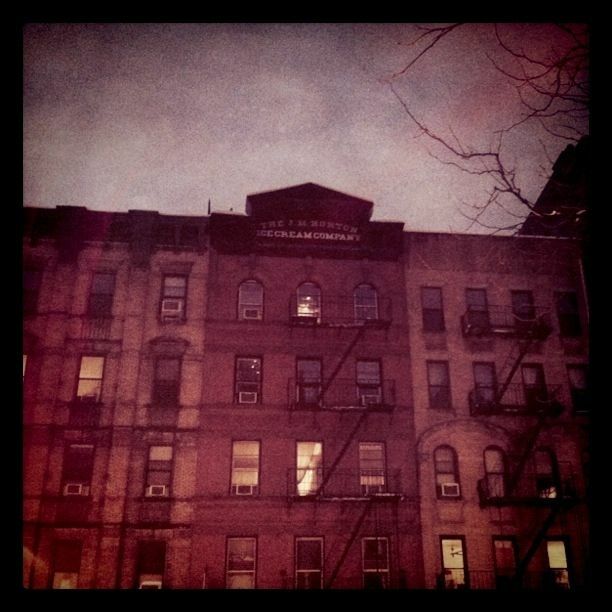 i love reading your nyc/huckster adventures! i purchased a lovely, posh, unisex toddler peacoat 2 years ago when i was 19...you give me hope+let me know that i'm not a psycho, and that other people do that too. woohoo! Could you pretty please post a picture of your lovely new moccasins? I have been dying for a new pair and need some inspiration. My last pair I bought in Scotland and can't seem to find a pair I love just as much. I just love coming to read your blog because I do nothing but giggle through (almost) every entry. I am so glad to have found you last September--seeing that there is a new post is always a bright spot in my day! If David Hasselhoff really does read this--I loved him in Knight Rider but haven't yet been able to get over the horror of seeing Sponge Bob and Patrick riding his hairy legs on the SB movie. The end. uhhh. 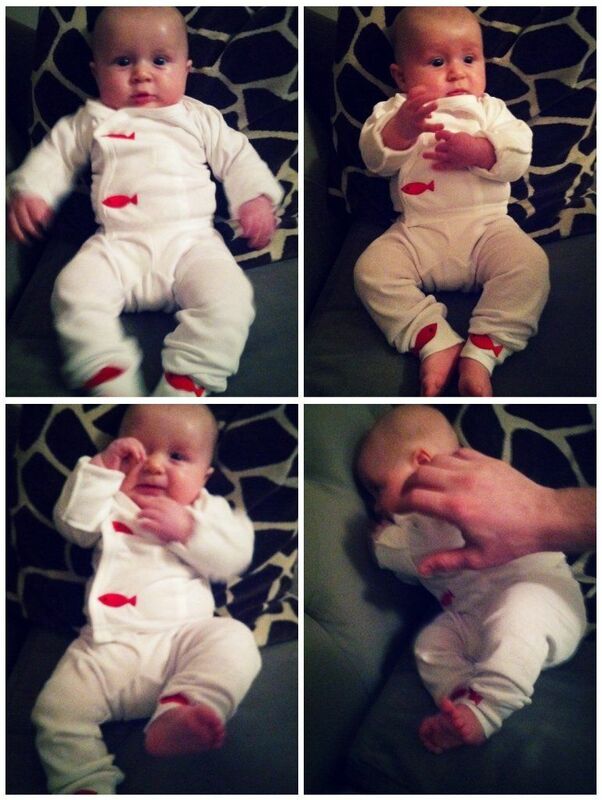 those fishy pjs are amazing! Oh, dear! I thought I was the only crazy mama to do such silly things. When I and 4 of my best friends from college went to NYC for our 30ths (we did all the things you said not to when in NYC, I'm afraid! ), I purchased a set of I <3 NYC jammies for a child I prayed I might have, but never dreamed I'd get. She is now 3 years old and so full of sass! And she totally rocked the jammies, too. Have a great Friday and may the Holbshubby be gainfully employed by the end of the day! Peace out from middle America. ps I am jealous of your mocassins. I don't even like hamburgers but I LOVE ME SOME Shake Shack! :) And isn't that snow great? Tell me, tell me, where did you find the mocassins??? My closet is tragically, mocassin-less these days and i need a cute pair- could you recommend please? ALso, I love the pajamas. I have a teeny pair of baby boy loafers that I bought forever ago... and i imagine the day i have a little guy to fit into them will be a very sparkly day indeed. Love this post! Love that the Hoff follows you on twitter. Awesome. Good luck to your husband! I wish I knew what firm it was with. This makes me have a better day just by reading this. The energy is wonderful! I used to work at a bookstore in Provo where all the Circle Ranch people were taken on their Sunday afternoon "field-trips." Also I worked with a guy from Wales. One Monday I came in and Wales excitedly informed me that "The Hassellhoff" had come in the day before. So now I can only refer to him as "The Hassellhoff" in a Welsh accent. I would join a hamburger cult. In a second. I just ate a 27 oz steak a couple weeks ago and wanted another one. Red meat. I'm glad to see there's another normal sized girl out there that shares my affinity for an iron-rich diet. Hey! 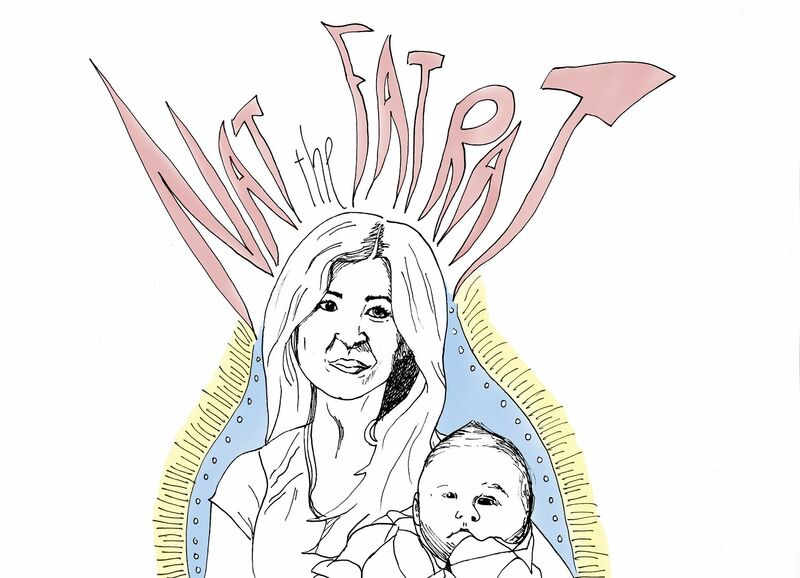 :+) That art creation of you & the babe is by my daughter Rae! So tickled to see you posted it up. She is always talking about you & has gotten several peeps to follow you. Rae writes a killer blog too all the way on the other side of the US called 'Acupuncture for the soul'. It's a cool riff on her life w/lil Miss Salem & day to day on the Boring/Portland Oregon edge. I encourage you (As only a proud mum would) to check it out! My favorite post to date. When you learn how to yodel from the top of a laundry mountain, will you teach me? I totally love it. I totally laughed at out loud continually through this post. Thank you. i love days like that! -not that i've had very many of them...but when they come, they are so celestial! i'm so happy for thee! How in the heck do you manage to find your camera when you need it, take a decent photo, load it onto your computer, and actually post it on your blog before it's seven months overdue? I'm stupefied. Also I'm feeling really guilty that there exist no photos of my fourth child. Thank You. I needed a good post today. Moccasins could indeed bring about world peace, I have always wanted a pair, that is probably why I don't float around on a cloud of peace all of my days. I should get some. I have also contemplated the joys of yodeling, that and playing the harmonica and kazoo. Ok, I have laughed a whole bunch reading around here. You make NYC sound so delish. mmmmm Lenny's...life doesn't get better than that. Cute little chubby bunny you have. Total snugginess. Hi Natalie! I found your blog via the Salon.com article-- no such thing as bad publicity, right? And I think you are awesome. I've spent the last couple of days perusing your archives. Even though I knew you eventually had a baby-- so cute, btw; I still wanted to read your story and I loved it. Thank you for writing and thanks for being honest. You are SO talented. I really admire you. Oh and I'm a Mormon mommy too. Okay, so, I love your blog! It is awesome. Also, I like the pajamas for your baby. They are so cute and 5 years? Awesome. I have a question, though... Where did you get your shoes in the photo in your header? They are so perfect...I was just wondering. Okay, thanks. Sorry, I disagree on the moccasins. But boots? Ah, I can hear the peace treaties being signed right now! I'm so happy for your best day ever, and I HOPE your Holbscholar gets his job! @Rachel, they're from Zara. I think Steve Madden makes a similar shoe, too? Salon led me to your blog, even though my husband doesn't wear flannel. Read this post Friday. Been thinking about your spaghetti noodle arms all weekend. I wish I would have thought of spaghetti noodle arms, but my arms aren't spaghetti noodle sized anyway. They are at least linguini sized, but not quite so flat... still looking for the perfect description of them.